How to verify SSO Multi-Master Replication is properly configured & working? You are here: Home / Automation / How to verify SSO Multi-Master Replication is properly configured & working? I wrote an article yesterday demonstrating a hybrid configuration using the new SSO Multi-Master Replication in vSphere 5.5 between a vCenter Server for Windows & a VCSA (vCenter Server Appliance). The process itself is pretty straight forward and I even created a script which will automate the entire configuration. However, other than some text being shown at the end of the script stating that MMR (Multi-Master Replication) being successfully setup; how do you actually confirm MMR is properly configured & working when adding additional SSO instances? This was something I was actually pondering about since the process was just too "easy" and pretty much seamless as it should be from a users perspective. In speaking with engineering, I came to learn that vmdird (VMware Directory Service) just leverages the LDAP standard for MMR. 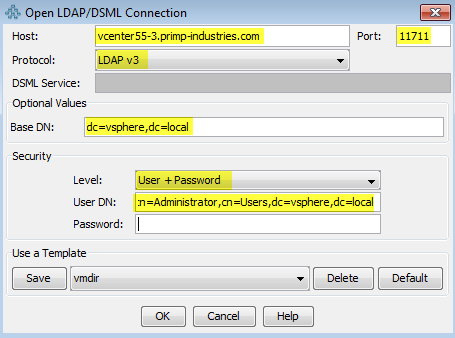 This means we can use any LDAP browser to connect to vmdird and view its current configuration. Disclaimer: Please take extreme caution when viewing the vmdird database, this is primary for educational purposes. You should not be making any changes while in the database else you can negatively impact your environment. In this example, we will be leveraging the free open source LDAP browser JXexplorer which can be run from variety of operating systems including Windows and Mac OS X. We will use JXexplorer to verify replication between our source (vCenter Server on Windows) is properly configured with our target (VCSA), you can also do this for a Windows to Windows vCenter Server deployment. We will also verify that replication itself is working by going through an example of creating an object in the source system and then verifying it has been successfully replicated to the target system. Step 1 - Download and install JXplorer on your desktop, it does not have to run on the vCenter Server itself as we can remotely connect to the vmdird. If everything was entered correctly, you should now be able to connect to the vmdird database. Step 3 - To confirm MMR has been successfully configured between your source and target SSO Servers, you can expand the inventory to local->vsphere->Configuration->Sites->Servers. Here you should see the list of SSO Servers participating in a specific site. If you expand each server, you should see a replication agreement between the source and target of each server, this means everything is configured correctly. 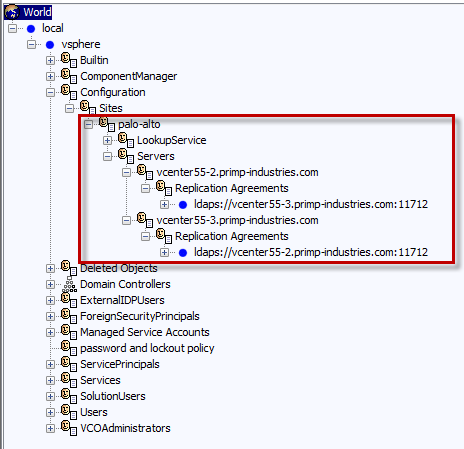 In the example I had in my last blog post vcenter55-3.primp-industries.com is my vCenter Server for Windows and vcenter55-2.primp-industries.com is my VCSA. We can clearly see the replication agreements between our two systems and everything looks good. Step 4 - To check whether MMR is working, a simple test is to create a user in vsphere.local domain using the vSphere Web Client and then compare the Users database between our source and target vmdird databases. 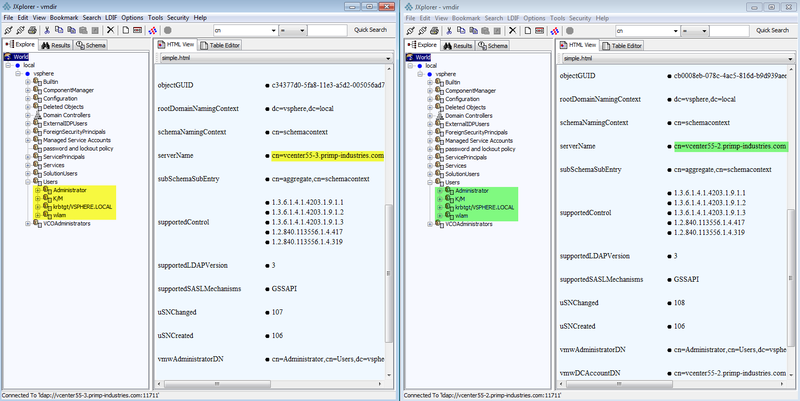 To do so, you can open up two JXexplorer sessions, one connecting to the source vmdird and the other connecting to the destination vmdird. MMR takes ~30sec to perform the replication and in the example above, I created a user called "wlam" on my source site and then I was able to refresh my destination system and the new user has automatically been replicated. I really like the new SSO architecture and has really simplified SSO installation and configuration by a factor of 1000x. The built-in multi-master replication is completely transparent to the end user and this is the type of user experience our customers have come to expect of VMware. Big kudos to the SSO Engineering/Product team for all their hard work! There is still a lot of work being done to further enhance the overall install/upgrade experience and hopefully we will get to see some of these benefits in the very near future. 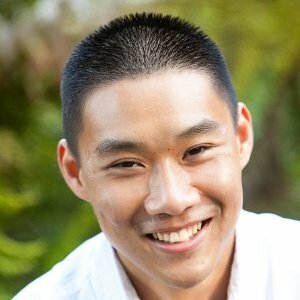 How do I find my SSO Server 5.5 Site name?